Home » Second half of the 18th Century. Fashion of the Rococo. French and German fashion of nobility. Baroque Rococo era. 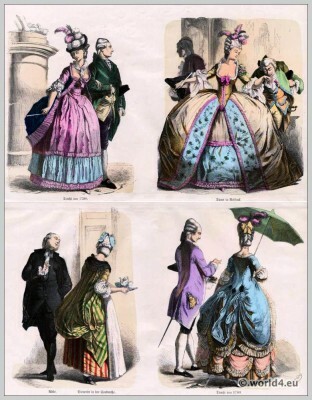 Top row left: Fashion of 1780 Right: lady in hoop skirt. Nobleman with allonge wig. Bottom row left: Abbé. Servant in the Contouche (Andrienne, robe à la Française). Right: nobleman and noblewoman in the fashion of 1780 (Crinoline fashion of Rococo period). This entry was posted in 1724, 18th Century, Ancien Régime, Court dress, France, Germany, Nobility, Rococo and tagged Crinoline, Münchener Bilderbogen, Rococo fashion on 1/20/14 by world4.